As you have seen Java is an object oriented programming language. Emphasis is placed on modularity through classes and their instantiation as objects. One of the most powerful concepts in object-oriented programming is inheritance. The strength of object-oriented programming is that is helps the programmer to organize the programs they write in an intuitive way. We are used to thinking of the world in terms of objects, their attributes and capabilities and the relationships between objects. Two of the most intuitive relationships that exist between objects are aggregation and inheritance. Aggregation you explored in Lab 3. It is simply the idea that some objects (and we can include abstract concepts as objects) are composed of other objects. An animal is composed of body parts (arms, legs, head, etc), a car is composed of car parts (engine, wheels, etc), a computer program is composed of instructions and data. We also tend to classify objects in the real world based on another kind of relationship. Dogs are a kind of mammal. A Doctor is a human being. Java is a kind of programming language. This idea is called inheritance. The class being inherited from is called the superclass , the class inheriting is called the subclass. In the example above the doctor is a subclass of human. Human is a superclass of doctor. In Java a subclass contains all the methods and variables defined in the super-class plus the subclass's own methods and variables. Java implements inheritance through the extends keyword. The doctor has all the attributes of being human plus extra attributes picked up in medical school. A doctor is a human. A human is a mammal. Therefore a doctor is also a mammal. The doctor class gets all the class variables and methods defined in class mammal, class human, and class doctor. However imagine we have a class called employee that doesn't extend any other class. Java does not let doctor extend employee and human at the same time. Only one class can be extended by a subclass. This is called single inheritance (some other languages allow multiple inheritance). Things start to get a little complicated (and useful) when we consider polymorphism. Polymorphism just means we can treat an object as if it were any of the subclasses it inherits from. For example we can treat the doctor object as being of class mammal, class human, or class doctor. This makes things easy in some cases, for example, when is doesn't matter to you that a mammal object is also a doctor. Would fail with a compiler error because the main method is not inside Mammal or any of its subclasses and age was declared protected. Would work because getAge() is declared public. An interface is a template that specifies the methods that must be included by any class that implements the interface. In large systems this helps to keep the classes "honest" and prevents the program from trying to use an object for a purpose it was not intended to fill. For example a graphics system might try to draw an object using its draw method. This wouldn't work very well if the programmer forgot to implement a draw method. You can also think of an interface as corresponding to the can relationship. A doctor can diagnose your illness, a human may or may not be able to do so. A Drawable object in Java can draw itself, some other object that does not implement the Drawable interface may or may not be able to draw itself. 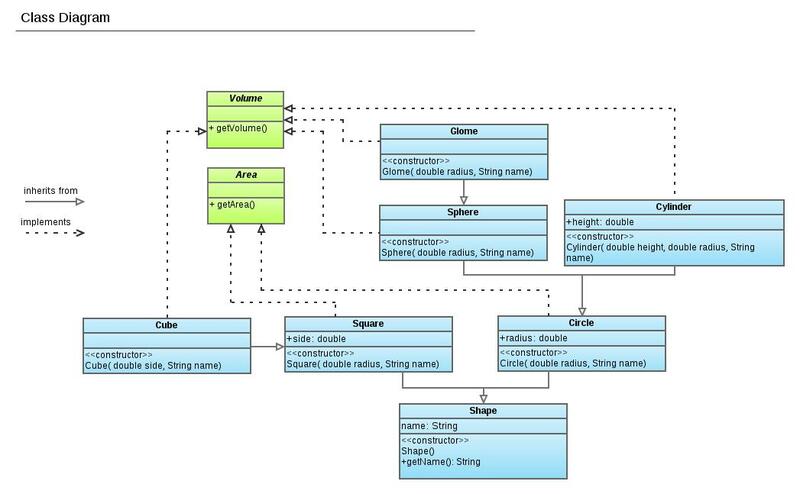 The connections between objects can become overwhelming so people often use UML (unified modeling language) diagrams to represent the relationships. For this lab assignment you will write a program to represent geometric shapes and some operations that can be performed on them. The idea here is that shapes in higher dimensions inherit data from lower dimensional shapes. For example a cube is a three dimensional square. A sphere is a three dimensional circle and a glome is a four dimensional circle. A cylinder is another kind of three dimensional circle. The circle, sphere, cylinder, and glome all share the attribute radius. The square and cube share the attribute side length. There are various ways to use inheritance to relate these shapes but please follow the inheritance described in the table below. All shapes inherit getName() from the superclass Shape. Your program will consist of the following classes: Shape, Circle, Square, Cube, Sphere, Cylinder, and Glome and two interfaces Area and Volume (Area.java and Volume.java are given below). Your classes may only have the class variable specified in the table below and the methods defined in the two interfaces Area and Volume. You will implement the methods specified in the Area and Volume interfaces and have them return the appropriate value for each shape. Class Shape will have a single public method called getName that returns a string. Your program will use the following source files. Do not alter them but feel free to write your own driver to test your program. Note: the volume of a glome is 0.5(π2)r4 where r is the radius. Email a zip file called lab4.zip containing your seven class source files: Shape.java, Square.java, Circle.java, Sphere.java, Cylinder.java, Cube.java, and Glome.java to cs251f12@gmail.com by midnight on the day of your next lab. Your email subject should be CS251 [your lab section] [your name]. Turn in a printed copy of your program at the next lab meeting. There are 100 possible points. The program shapegrader (source code above) will award up to 75 points. The remaining points are assigned based on the style of your source code.